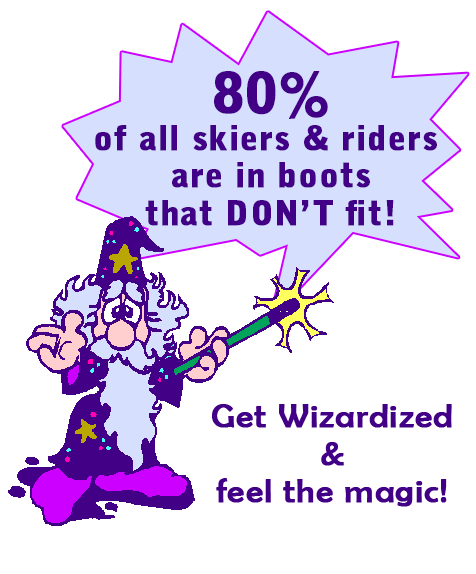 Ski, Ride or Stay at one of the Boot Wizard’s favourite places in the Canadian Rockies! One of the “have to ski” resorts in the Canadian Rockies. 100% natural snow. Great skiing and riding at the Canadian Rockies first ski area. Banff’s largest snowboard park, excellent skiing for the whole family. Site of the 1988 Olympics. Great skiing and riding for the whole family. World Cup Ski Teams train here and so can you. Located in Kananaskis Country KPOW provides a Fortress Mountain cat skiing experience. Superb accommodation in the Canadian Rockies, Banff and Canmore. Ranging from 2 bedroom condo to luxury homes. hotel at Lake Louise in the heart of the Canadian Rockies. Do your feet hurt when you ski or ride?